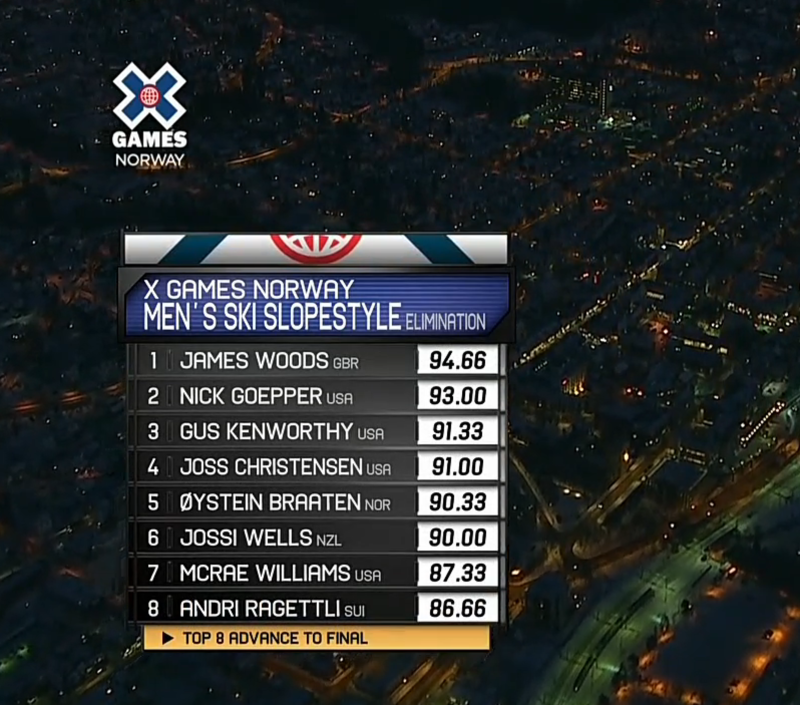 X Games Norway 2017 kicked off yesterday night with men’s ski slopestyle eliminations. As the Snowboarding slopestyle elimination event was cancelled already due to speed issues it was clear for everybody that this is not going to be an easy event to secure a spot in the finals. The jumps were particularly small compared to what everybody is used from Aspen and it was snowing quite a bit during the finals too, making it very hard for the boys to maintain speed and clear those landings. Meaning clean and well grabed tricks where the name of the game, in order to maintain speed throughout the whole course. On the other hand, the rail features were quite creative and provided tons of opportunities to improve scores. Many of the top guys, such as Jesper Tjäder, Henrik Harlaut or ABM fall victim to the difficult speed conditions and where not able to bring down a clean run. ABM had one of the craziest crashes nose taping the knuckle on a double cork 7. Jesper went all creative with a flatspin coming from outside the course back into it, but was unfortunately not able to hold it together on a handdrag 360 over the axe, resulting in a nasty crash too. Jossi Wells was clean as a whistle even giving a look back to the camera guy and switch handdraging down the icy course in between the rail sections. Woodsy took the top spot with clean execution, massive rail tricks and a crazy switch double cork 10 octo grab. Nick Goepper followed in 2nd place with a very clean run throughout the whole course. Gus Kenworthy took 3rd place with a super clean double cork 1080 blunt. Andri Ragettli and Oystein Braaten where the only to Europeans forrutnate enough to make it into the finals. X Games Norway 2017 will continue this today with women’s ski slopestyle finals at 3 pm followed by men’s ski slopestyle finals at 7:15 pm. Friday afternoon men ski big air qualifications will go down at 2:30 pm, followed by ski women’s Big Air at 6 pm and men’s ski big air finals at 8 pm on Saturday evening respectively. You can watch the X Games live either on ESPN, which is about 7,99€ or if you have a proxy you can stream it live from Norway on Sumo TV2. If you have ProSieben Fun you can watch it live too.